In the frame of the Interreg Europe funded project “Social Enterprises in Sparsely Populated Areas – SOCENT SPAs”, a report was compiled on the status of social enterprises in Finland and in particular in Lapland. This report will serve as base for the development of an Action Plan for Lapland, which is to be implemented for the introduction of a comprehensive social entrepreneur support scheme in sparsely populated areas. Data for the report was collected by conducting desk research on social entrepreneurship in Finland, its legislation, terms, concepts and related issues. In addition, three interviews with stakeholders of social enterprises in Lapland were conducted, which were subsequently analysed using the STEEP method. Social entrepreneurship is a relatively new issue in Finland (European Commission 2014). As the welfare system in Finland is fairly developed, the meaning of families is not as central and thus, the purpose of social enterprises is quite different from other countries (Pättiniemi 2006, p. 3). In the Finnish language, there are two different definitions for social enterprise, making international comparison difficult. Sosiaalinen yrittäjyys translates to social entrepreneurship and so does yhteiskunnallinen yrittäjyys. Nevertheless, it is agreed that sosiaalinen yrittäjyys can be translated to work integration social entrepreneurship, making distinguishing between the two terms while translating social entrepreneurship into Finnish somewhat easier. Apart from going through the register of holders of the Finnish Social Enterprise Mark manually, it is difficult to obtain any statistical information on the number of social enterprises in Finland or, for that matter, in Lapland. As stated in the definition of social enterprise by the Ministry for Economic Affairs and Employment, social enterprises need to be listed in the ministry’s register of social enterprises. 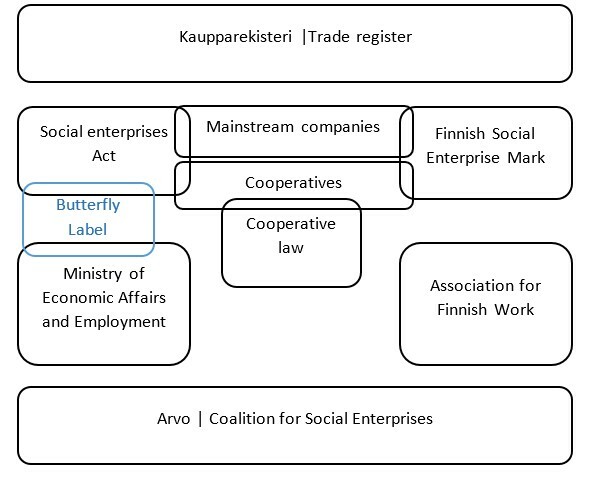 Nevertheless, in Finland many organisations show characteristics of social enterprises, without holding the official mark or being listed in any register. These organisations usually hold the legal form of association, foundation or cooperative. Especially cooperatives have a long history in Finland and their values include for instance ethical behaviour, democracy, caring for others, social responsibility, equality and solidarity (ICA 2017). Hence, when looking at statistics for social enterprises, the register of Pellervo, the Finnish association for cooperatives, should be taken into account. Overall, it seems that the registers do not give a comprehensive picture of the number of social enterprises in Finland. Hence, estimating the amount and profile of social enterprises in Finland is quite challenging. However, what can be seen from the registers is that Lapland is considerably underrepresented in them, with only two holder of the Social Enterprise mark in Lapland. The current situation of social enterprises in Lapland has been analysed also with the help of interviews. The interviewees were chosen based on their affiliation with social enterprises and in order to give a broad view of social entrepreneurship in Lapland. Among the interviewees was one participant from a cooperative in northern Lapland, one from an enterprise holding the Finnish Social Enterprise mark in Rovaniemi and one from a local development agency in central Lapland. The interviews clearly showed that there is a demand for social entrepreneurship in Lapland. However, this demand currently is not met by lawmakers or governing bodies, but is presently mostly fulfilled by associations, foundations and cooperatives. Nevertheless, with the upcoming province reform as well as the reform of the Finnish health care and social services system, it is believed that the demand for social enterprises will increase and that municipalities will have to respond to it. Models of other countries regarding social entrepreneurship, their implementation and support systems are investigated. European Commission. (2014). A map of social enterprises and their eco-systems in Europe. Country report: Finland. ICF consulting. ICA. 2016. Co-operative identity, values & principles. Osoitteessa: http://ica.coop/en/whats-co-op/co-operative-identity-values-principles, Accessed 7.3.2017. Suomalaisen Työn Liitto. (2017). The Finnish Social Enterprise mark Terms and Conditions. In http://suomalainentyo.fi/en/services/finnish-social-enterprise/the-finnish-social-enterprise-mark/. Accessed 7.3.2017. TEM (2017). Sosiaalisen yrityksen rekisteröinti. In. http://tem.fi/sosiaalisen-yrityksen-rekisterointi. Accessed 21.3.2017.